The following list outlines our most common questions, but we encourage you to contact our Guest Services team to discuss planning your heli ski vacation. How fit do I need to be to heli ski? Do I have to be an expert skier to book a package? What will be the ability of the other skiers in my group? Can I bring my own skis or board? What is the minimum age for heli skiing? Q. When should I arrive for my trip? Guests arriving for multi-day packages should arrive in Revelstoke at The Hillcrest Hotel for check in by 5:00 pm. Our orientation starts at 6:30 pm on your day of arrival. Everyone is required to attend. You will learn essential information such as where and when to meet your group, safety information, hotel amenities, and more. If you happen to experience travel delays, please contact our staff at 1-800-663-7080. Q. How fit do I need to be to heli ski? To fully enjoy heli skiing you should be in good physical shape. We recommend that you engage in some kind of exercise program for eight to ten weeks prior to your ski trip. It stands to reason that the fitter you are, the better you will be able to overcome any skiing challenges and avoid injuries. Q. Do I have to be an expert skier to book a package? If you are a strong intermediate skier in a regular ski area you should be able to adapt to deep powder snow skiing. We recommend that you visit a ski area to brush up on your skills if it has been a while since you have strapped on skis or a board. If you can try some gladed runs and powder, that’s even better! Revelstoke Mountain Resort is close by, and a perfect match for the terrain you can expect to encounter in our tenure. We recommend that you try a pair of our high performance skis and boards suitable for the snow conditions. Q. What will be the ability of the other skiers in my group? When and where we can, we will try to put you in a group with similar skiing ability. However, certain factors may limit our ability to do this, including the type of program, length of stay, group size, and the combined weight of the group. Our options are limited and we appreciate your understanding and cooperation in this matter. To avoid any conflicts, simply convince ten of your closest friends to come with you! Q. Can I bring my own skis or board? You are certainly welcome to bring your own equipment, provided your skis have the mandatory brakes. If you have narrow carving skis, we would like to warn you that they likely won’t be suitable for heli skiing and you should make use of our wider options, which are included in your heliski package. Selkirk Tangiers continually experiments with new brands of skis in various lengths and widths to provide you with the optimal tools for the conditions. You can find our current inventory on our Equipment Rentals page. We do not have ski boots available so we strongly recommend you carry your boots on the plane as hand luggage. Clothing should be water resistant, windproof and breathable. If snow sticks to your suit, it is best to leave it at home. It is a good idea to bring several pairs of gloves or mitts and good socks. Temperatures vary from around the freezing mark to 30 degrees Celsius below zero, depending on the weather and the elevation. Bring clothing that you can layer so that it is possible to add or remove clothing as necessary. We have a selection of clothing, powder gloves and ski accessories for sale in our Retail Shop if you find that you have left something essential behind. Q. 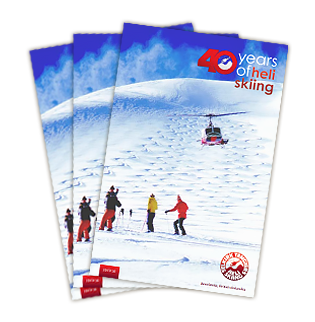 What is the minimum age for heli skiing? Heli skiing is a wilderness activity that involves risks, dangers, and hazards. Each participant must be capable of assisting themselves and others during an emergency situation. Selkirk Tangiers Helicopter Skiing requires participants to be 15 years of age or older. All participants who are 18 years old or younger must have a parent or guardian to co-sign their waiver as well as ski with them at all times. These age restrictions have been derived through over 40 years of operational experience and an evaluation of industry standards. We hope you understand and we look forward to skiing with you when the time is right. Q. When is the best time to go heli skiing? Ski conditions vary throughout the season. In early season – December, January, and early February, winter storms bring us plentiful snow resulting in deep powder conditions where we will tend to ski predominantly in the trees. As the season progresses into late February and March, we see more spring like skiing conditions with longer days and boot top to knee deep powder. This is the time of year when we reach our vast alpine bowls and glaciers more often. In April, we typically experience plenty of great snow at higher elevations with awesome corn snow skiing on the lower sections of the runs. These are generalizations and conditions can vary widely during any time of the season. We can experience all types of skiing within one week – it just depends on what Mother Nature gives us. Q. Can my dietary requirements be catered for? Our catered lunches are ordered from a local café the day prior to your trip. Please include any dietary restrictions on your booking form during registration. Please call or e-mail us at least 48 hours in advance to make any changes. Plus, our breakfast and après ski buffets offer a wide selection of food items. If you have trouble finding something that suits your needs at that time, a server will be happy to help. Q. Do I need to sign a waiver? Each guest is required to sign an industry standard Release of Liability Waiver form at our location prior to skiing. A copy of this waiver is located here: English | German. The waiver will be provided during check-in as it must be witnessed and signed by an STHS Guest Services staff member. If you would like to sign a waiver in a language other than English, please let our staff know at check-in and we will do our best to accommodate.